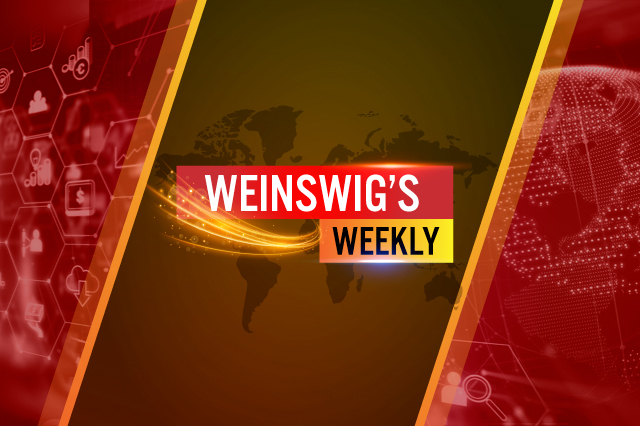 This week’s note “From the Desk of Deborah Weinswig” looks at the promise of 5G smart phone technology for the retail industry. In the US, Sears, which emerged from bankruptcy in February, has announced it will open three new “Sears Home & Life” stores in May. A late Easter and Brexit uncertainty caused UK retail sales to fall 0.5% year over year in March, according to the British Retail Consortium (BRC)-KPMG Retail Sales Monitor. Japanese retailer Aeon will convert 80 of its 480 retail outlets in China into self-serve smart stores. The next generation of cell phone service is coming: 5G. The new standard promises performance enhancements that hold great promise for retail, potentially making it easier to boost conversion rates and e-commerce revenues. 5G promises to change the ways in which users interact with their smart phones: The new standard will make smart phones able to do more, and faster. Reaction times will fall to near zero, so delays that can slow the smart-phone shopping experience – and frustrate shoppers – should disappear. The global 5G subscriber count is expected to hit 1.3 billion by 2023, according to the trade association 5G Americas. The new technology is estimated to generate incremental US e-commerce revenue of $21 billion by 2021, according to Adobe. 5G is the fifth major generation of wireless technology and represents a big leap versus today’s 4G LTE (long-term evolution) wireless technology. 5G offers peak data transmission speeds of 10-20 gigabits per second (GBPS), similar to what people would experience at home using a cable modem connection. 5G increases coverage and enables more devices to be connected, making Internet of Things (IoT) features more feasible. Other 5G features include lower latency (the time it takes to connect to the network and respond to user requests, such as clicking on a product thumbnail when shopping to get more information on the product), which will also enable real-time AR and VR over mobile devices. The greater coverage and higher data rates should make the mobile Internet more accessible — even potentially displacing some wired connections — making it more efficient, convenient and entertaining to shop online. Mobile e-commerce websites can become more engaging and visually appealing, using more images and videos and enhancing them with AR and VR. The combination of greater speed, lower latency and higher connection density will make it even easier for consumers to shop while mobile. With faster speeds, shoppers can more quickly complete a smart phone transaction, boosting conversion ratios. There is a positive correlation between connection speed and conversion, according to research from Adobe. The higher density of 5G will also enable many devices to be connected at once, enabling smart manufacturing, sourcing, supply chains, and deploying technology throughout brick-and-mortar stores. Physical stores can use 5G to enable networks of IoT sensors that can manage inventory with AI systems that connect to supply chains to automatically replenish shelves. Wireless mobile technology can also transmit facial recognition data, enabling team members or robots to provide more personalized customer service. When Can We Have 5G? Some mobile carriers already announced the launch of 5G service, and 5G-capable handsets are scheduled for launch starting May 2019. However, standards for the global mobile industry are set by the 3rd Generation Partnership project, a coalition of service providers, and the organization has not yet published final specifications for 5G. The new 5G standard will enable a slew of new features for retail, making online shopping faster, easier and more entertaining. The technology will also enable many in-store services that can boost productivity in the front and back of the store. 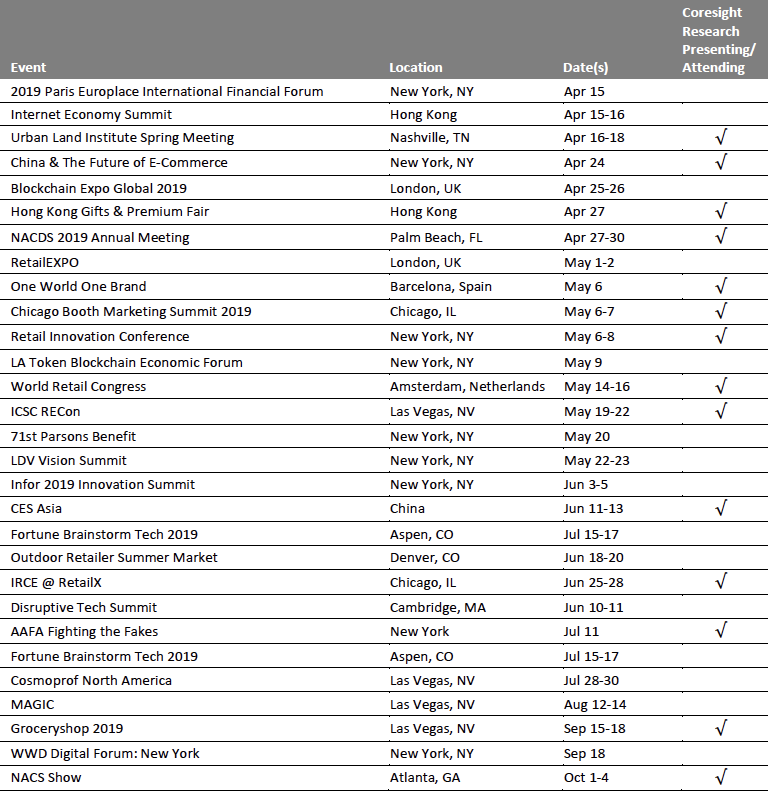 That said, full-scale deployment of real 5G may be another year out. Please click here to read our report 5G in Retail: Growing Revenues in E-Commerce, Boosting Capabilities in IoT Technologies, and Unleashing Potential in AI, AR and VR. 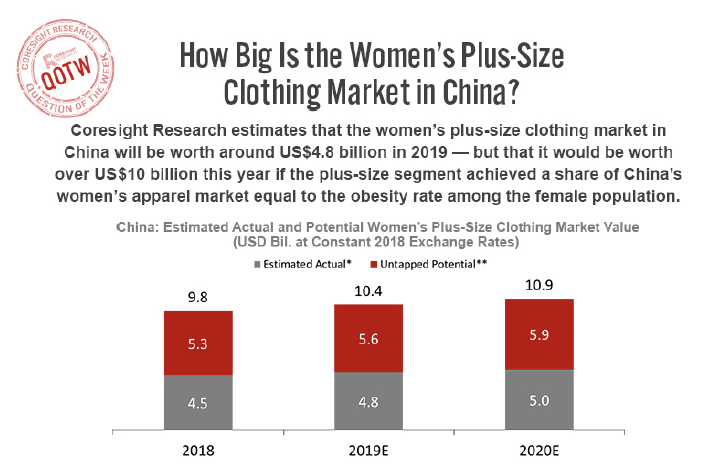 The total potential market value is based on the plus-size market capturing a share of the women’s clothing market that is equal to the proportion of women that are classified as obese (i.e., 6.5%). *“Estimated Actual” is based on the relative underindexing of the plus-size market versus obesity rates in the US. • Luxury fashion house Roberto Cavalli has closed all its US stores and is preparing to liquidate its North American operations. The company is expected to file for Chapter 7 bankruptcy this week. • The store closures occurred around the same time that multiple news outlets reported Roberto Cavalli is seeking an agreement with creditors while it searches for an investor. • Sears is starting its next chapter with openings instead of closings. The retailer, which emerged from bankruptcy in February, has announced it will open three new “Sears Home & Life” stores in May. • The small-format stores will range in size from 10,000 to 15,000 square feet and will be in Anchorage, Alaska; Lafayette, Louisiana; and, Overland Park, Kansas. • The national retail vacancy rate stood at 10.2% at the end of the first quarter of 2019, unchanged from the previous period and up 20 basis points from the first quarter of 2018. • The average asking rent for US retail space closed the quarter at $21.30 per square foot, up 1.6% from a year ago. Net absorption for the opening quarter was 949,000 square feet, a small decline from that period in 2018. • The total market share of “nonstore” US retail sales (mainly online retailers) was higher than general merchandise sector sales for the first time in history. • In February, nonstore sales narrowly beat general merchandise stores, including department stores, warehouse clubs and supercenters. Nonstore retail sales last month accounted for 11.81% of the total, compared with 11.80% for general merchandise retailers. • US clothing retail chain Charlotte Russe Holdings has completed the sale of its Peek Kids brand and related intellectual property to women and children clothing manufacturer Mamiye Brothers. Mamiye will continue to operate its e-commerce and wholesale offerings. • The fashion retailer has also completed the sale of its Charlotte Russe brand and related intellectual property to Canada-based fashion chain YM Inc.
UK retail sales fell 0.5% year over year in March, according to the British Retail Consortium (BRC)-KPMG Retail Sales Monitor. 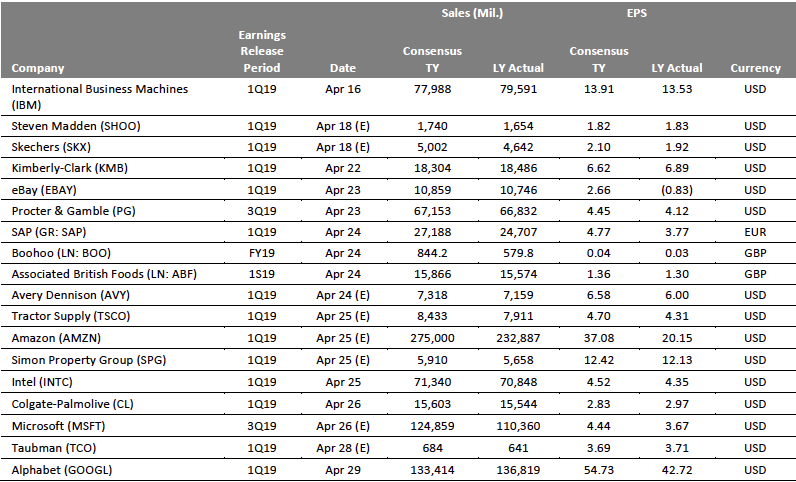 Comparable sales decreased 1.1%. The BRC noted that Easter falls much later this year, shifting some sales from March to April, and pointed to consumers spending carefully on big-ticket items amid Brexit uncertainty. The BRC splits food and nonfood retail sales on a rolling three-month basis. In the three months ended March, total food sales grew 1.3% and total non-food sales grew 0.1%. On Tuesday, British department store retailer Debenhams confirmed it had entered administration after it rejected a revised £200 million ($262 million) last-minute offer from Sports Direct. Investors in Debenhams saw their stakes wiped out in the administration. As part of the “prepack” administration process, Debenhams will be controlled by a group of lenders, who will provide the £200 million ($262 million) it needs to fund near-term obligations. Debenhams also plans to restructure its store estate after a review; it had previously announced that about 50 stores were earmarked for closure. French multinational retailer Carrefour and Belgian pharmacy chain Medi-Market have entered into a long-term strategic partnership. In the first phase, some Carrefour hypermarkets will feature shops-in-shops, or para-pharmacies, which sell health and wellness products without a pharmacist having to be present. Some hypermarkets will feature a full pharmacy. Lidl’s CEO Jesper Hojer has stepped down citing personal reasons, the company announced. Hojer joined Lidl’s board in 2015 and was named CEO in 2017 to replace Sven Seidel. Ignazio Paternó, Deputy Purchasing Director, has been appointed interim CEO until a replacement is found. Delhaize Fresh Atelier, a new convenience store concept in Belgium from Ahold Delhaize, has launched YesWeScan, a mobile self-scan and payment app which will allow customers to skip the checkout. Shoppers can pay by smartphone through the Payconiq/Bancontact app, Apple Pay or Google Pay. 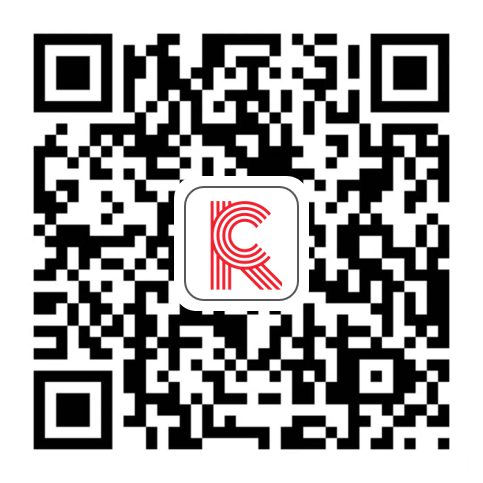 After payment, customers receive a digital ticket in the app as well as a receipt to their registered e-mail. Skechers has opened an experiential concept store in Singapore. The 5,000-square-foot space uses new visual-merchandising and store-design elements to showcase its product ranges including performance, lifestyle and Skechers Kids. The key message behind each product range is highlighted using visual images and artwork to create a story-driven design. This is also Skecher’s first store in Singapore to feature a shoe customisation zone with embroidery and heat-press personalization. Japanese shopping center operator and retailer Aeon will convert 80 of its 480 retail outlets in China into self-serve smart stores. These stores will use facial recognition technology to identify customers, recommend items and provide coupons based on purchasing habits and digital payment history. Customers can then make purchases and checkout using their smartphones. Aeon will also establish an Aeon Digital Management Center to accelerate the development of digital technology needed for store management, an online supermarket and a cross-border e-commerce platform to improve the retailer’s smart shopping experience. Japanese personal care company Shiseido has signed an agreement with Alibaba Group and opened an office in Hangzhou to work with the Chinese retail group. The partnership will combine Alibaba’s strength in digitalization and consumer engagement with Shiseido’s research and development to create products specifically for consumers in China. Shiseido CEO Kentaro Fujiwara said the office will strengthen collaboration with Alibaba’s B2C marketplace Tmall to strengthen its position in China. China’s e-commerce company JD.com has opened its blockchain protocol, JD Chain, to enable other enterprises to access its underlying blockchain framework and build custom applications. JD believes this technology has the potential to enhance transparency in supply chain markets, which will assure customers of the quality and authenticity of their purchases. Philippine investment firm SM group has introduced its first in-mall customer service robot, named Sam, in the SM Megamall in Manila. The robot will help customers with directions to stores within the mall and information on deals, promotions and events. Sam is equipped with an advanced face recognition technology which helps it meet customers with personalized greetings. Shoppers can also chat with Sam on the mall’s Facebook page to get information on branch locations, mall schedules and promotions. Intimate fashion brand Victoria’s Secret is planning to open five stores in Peru’s capital city Lima in 2019. The stores are set to open in Mall del Sur, Real Plaza Puruchuco, Real Plaza Salaverry and La Rambla San Borja. The brand will also open its first flagship store in Peru between July and August this year. The store will be in the Jockey Plaza shopping center. In Mexico, Walmex reported a 5.3% year-over-year increase in sales in March; this compared to 6.4% growth in February. Walmex grew comparable sales 4.4% year over year in March, down from 5.4% growth in February. In March, Walmex opened five stores, which included three Bodegas Aurrera Express stores and two Bodegas stores. Apparel and accessories retailer H&M will open three new stores in Colombia in 2019. The stores are expected to create around 250 jobs. Currently, H&M operates four stores in Mexico and employs around 320 people. The stores are scheduled to open in the following shopping centers: El Tesoro in Medellín, Viva Envigado in Envigado and Centro Mayor in Bogotá. Brazilian software company Totvs has launched a fintech arm that offers financial products to Totvs user organizations across sectors such as retail, education, healthcare and manufacturing. Eduardo Neubern, Executive Director of the new division, said that the company expects to simplify and extend customer access to credit and financial services. Peruvian development bank Cofide and an association for early-stage capital Pecap have signed an agreement to create activities and educational and training programs to promote start-ups in Peru. US: US unemployment remained unchanged at 3.8% in March, in line with the consensus estimate. The IHS Markit composite purchasing manager index (PMI) for the US came in at 54.6 in March, ahead of the consensus estimate of 54.3, but down from the 55.5 reported in February. Europe: Eurozone retail sales increased 2.8% year over year in February, beating the consensus estimate of 2.3% and improving significantly from the 2.2% sales growth recorded in January. In Germany, the trade surplus increased from €18.6 billion in January to €18.7 billion in February, ahead of the consensus estimate of €18.0 billion. Asia Pacific: In Japan, personal consumption expenditure grew 1.7% year over year in February, below both the consensus estimate of 1.9% and the 2.0% increase in January. In Singapore, the manufacturing PMI edged up 0.4 points month over month to 50.8 in March, the 31st consecutive month of expansion in manufacturing activity. Latin America: Colombia’s consumer price index (CPI) increased to 3.21% in March from 3.01% in February, and slightly above the consensus estimate of 3.17%. Brazil’s composite PMI increased to 53.1 in March from 52.6 in February, the highest in 13 months. *Coresight Research’s evaluation of the actual figure’s impact on the economy relative to historical benchmarks and the current macroeconomic environment; + indicates a positive signal for the country’s economy, – indicates a negative signal and = indicates a negligible or mixed impact.